They fooled him last year. He knew it was coming this time. Blue Springs senior Dalvin Warmack was announced Tuesday morning as the Thomas A. Simone Award winner for the second straight year, an honor reserved for the top high school football player in the Kansas City area. He’s the first two-time winner in the award’s 31-year history. “I get to know what Archie Griffin feels like,” said Warmack, referring to college football’s only two-time Heisman Trophy winner. Warmack received the Simone Award during a ceremony Tuesday morning in front of his classmates at Blue Springs High School. It was intended to be a surprise — as it is every year — but unlike the 30 previous winners, Warmack had the advantage of going through the process once before. So when family and coaches tried to trick Warmack into thinking they were headed to a ceremony at Gardner Edgerton High School to honor finalist Traevohn Wrench, it fell flat. Warmack ran for 2,223 yards and 29 touchdowns this season and also caught three scores. 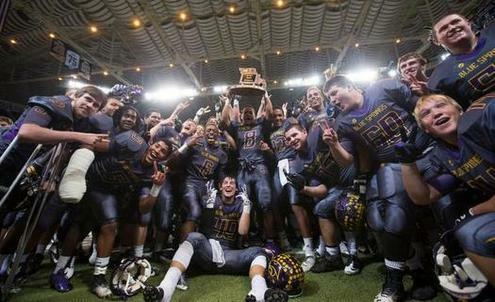 The Wildcats won the Missouri Class 6 state championship for the second consecutive season. It’s been especially meaningful for Warmack, who first learned of the prize when he was a seventh-grade football player for the Necco Raiders. The team was coached by Thomas Simone’s brother, Charlie, who often told his players the story of tragically losing his brother in 1983. Warmack wore a No. 73 patch on his jersey, the number Thomas wore for the same youth football program. ST. LOUIS Ian Brown threw a pair of touchdown passes to Kaleb Prewett to lead Blue Springs to a 35-14 win over Rock Bridge in the Missouri Class 6 state championship Friday at the Edward Jones Dome. 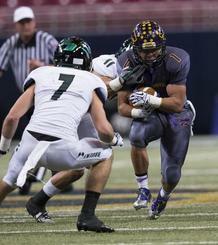 Cobi Bissell ran for two scores for Blue Springs (14-0), which won its second successive title and fifth overall. "I'm so proud of the guys to be able to do this for 14 weeks," Wildcats coach Kelly Donohoe said. "We had a great group of guys that were committed to the group only." Brown connected on 11 of 18 passes for 165 yards. He hit Prewett on scoring tosses of 17 and 8 yards early in the second quarter to push the lead to 21-0. Darrius Shepherd returned a punt 49 yards for the first Blue Springs score. "We got off to a slow start," Shepherd said. "I just wanted to make a play. After that, we started rolling." Rock Bridge (8-6) reached the title contest despite losing its final four regular season games. After falling behind 28-0, the Bruins got an 8-yard TD pass from Logan Twehous to Zach Reuter five seconds before halftime and a 1-yard TD run by Hayden Johnson with 1:20 to go in the third to make it interesting. But the Wildcats squashed the momentum with a quick three-play, 80-yard drive capped by Bissell's second TD run to close the scoring with 16 seconds left in the third. Blue Springs, Lamar and Webb City, all three of Friday's title-game winners, were repeat champions. 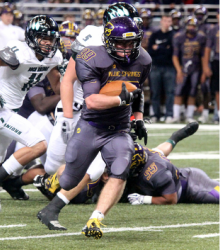 The Blue Springs football team began the season as the top-ranked team in Missouri Class 6 by virtue of their 2012 championship.On Friday at the Edward Jones Dome, the Wildcats ended the season in the same spot, capping an unbeaten season with a 35-14 victory over Rock Bridge in the 2013 championship contest. “We always want to be the hunted and not the hunters,” Blue Springs coach Kelly Donohoe said. “It was 14 weeks of fending people off, challenge after challenge after challenge.” It was the fourth state championship for Donohoe in five tries and the school’s fifth title overall. “I am probably more relieved after this one,” Donohoe said. “Every championship is different and special, but I really wanted this one for the seniors. It is not a big class numberswise, but it is a special class.” It was the ideal ending for seniors such as linebacker Gunner Strickland. “It is really surreal,” Strickland said. “I remember going to the championship game in 2003, and I just idolized the Wildcats. It is so special to win back to back.” The back-to-back titles are the first in Blue Springs’ history. Things started slowly for both teams until one of the Wildcats’ seniors, Darrius Shepherd, took a punt 49-yards for the first score of the game. “Shep has a knack for the big play,” said Strickland, who made a crunching block on the return. “He had the return for a touchdown last year against Rockhurst.” Shepherd felt the team needed a big play after struggling early. “Our plays weren’t working early,” Shepherd said. “I just wanted to make a big play and spark the offense.” Mission accomplished. Bruins meet beast in Blue Springs for state football title Unbeaten, top-ranked Wildcats out to repeat. Blue Springs football Coach Kelly Donohoe doesn't like to compare his past football teams to his present one, but he's heard plenty of other people doing that this season. Bringing his fourth team to St. Louis for the MSHSAA Show-Me Bowl in his 14th year as the Wildcats head coach, Donohoe might just be sending his best squad yet onto the Edward Jones Dome turf when the top-ranked Wildcats (13-0) meet unranked Rock Bridge (8-5) for the MSHSAA Class 6 title at 7:30 tonight. "Well, everybody's saying we're better," Donohoe deadpanned during a phone interview this week.Donohoe admits that this year's top-ranked and undefeated squad might be a little bigger and stronger than last year's group that finished a 13-1 state-championship campaign with a 42-3 blitzing of Francis Howell. Last year's title has this year's team in position to accomplish a first for the perennially successful football program. "I think our seniors have been on a mission to do something that's never been done at Blue Springs and that's win" state "back-to-back," Donohoe said. "So this is it. This is what we've been working for. "I will say this is a pretty special football team." The Wildcats appear to have all the pieces to repeat. Running behind a retooled offensive line that returned only Colorado State recruit Jordan Benson, running back Dalvin Warmack eclipsed 2,000 rushing yards for the second straight season and junior transfer Ian Brown from Kansas City rival Rockhurst answered on off-season question mark at quarterback by throwing for 30 touchdowns and only four interceptions. Defensive end Elijah Lee and safety Kaleb Prewett, who along with Warmack have verbally committed to Kansas State, lead a swarming defense that has allowed only 17 third-quarter points. Blue Springs extended its current winning streak to 23 games by successfully traversing a schedule that included wins against seven state-ranked squads. The Wildcats handed Class 5 finalist Lee's Summit West its only loss and also defeated three teams — Rockhurst, Liberty and Raymore-Peculiar — that beat Rock Bridge. ST. LOUIS-- Ian Brown threw a pair of touchdown passes to Kaleb Prewett to lead Blue Springs to a 35-14 win over Rock Bridge in the Missouri Class 6 state championship Friday at the Edward Jones Dome. 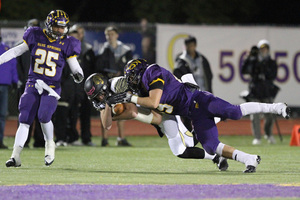 Cobi Bissell ran for two scores for Blue Springs (14-0), which won its second successive title and fifth overall. "I'm so proud of the guys to be able to do this for 14 weeks," Wildcats coach Kelly Donohoe said. "We had a great group of guys that were committed to the group only." Brown connected on 11 of 18 passes for 165 yards. He hit Prewett on scoring tosses of 17 and 8 yards early in the second quarter to push the lead to 21-0. Darrius Shepherd returned a punt 49 yards for the first Blue Springs score. Rock Bridge (8-6) reached the title contest despite losing its final four regular season games. After falling behind 28-0, the Bruins got an 8-yard TD pass from Logan Twehous to Zach Reuter five seconds before halftime and a 1-yard TD run by Hayden Johnson with 1:20 to go in the third to make it interesting. But the Wildcats squashed the momentum with a quick three-play, 80-yard drive capped by Bissell's second TD run to close the scoring with 16 seconds left in the third. Joey Butler has been delivering empowering messages for 14 years at the request of team coaches. They instill positive character traits in football players. Butler’s words haven’t stood without action. Each week the 52-year-old helps create ‘The Winner’s Manual’ a catalog of positive reinforcement for young athletes. He’s also organized summertime trips to Peru and Jamaica, where players volunteered to build houses for the needy. But now Butler’s own frailties are tested. He was diagnosed with inoperable cancer in late 2011 and he’s undergone seven rounds of chemotherapy. Joey said he’s electing not to pursue experimental treatment and his future hangs in the balance. Until recently, Butler was pastor at Gateway Church in Blue Springs. He said he was forced to resign when his health began to fail. To watch the video and interview of Joey, Click here. “A little motivation,” Donohoe said with a smile after his team romped past the Tigers Friday night in battle of unbeatens, 49-7. 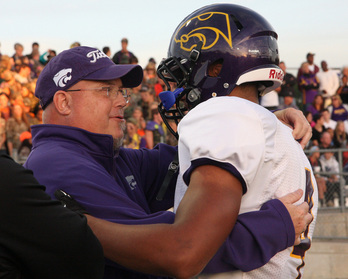 The top-ranked Wildcats moved to 9-0 and won another conference championship in the process. “Coach has said from game one to now that we still haven’t played the perfect game,” defensive lineman Carlos Davis said. “To play the perfect game and win a conference title was great.” This one didn’t take long to get out of hand. The Wildcats needed just five plays to go 52 yards on the games opening drive, capped by a Dalvin Warmack 8-yard touchdown run. While the offense struck quickly, so did the defense, as they got pressure on Tiger quarterback Drew Lock, forcing a bad throw off his back foot that was intercepted by Kaleb Prewett. Four plays later Warmack was in the end zone again, this time from 1-yard away, set up by a 42-yard run from Darrius Shepherd. After Lee’s Summit countered with a touchdown pass from Lock to Caymen Metcalf, the Wildcats’ ground game came right back. Shepherd had another long run, this one from 36 yards away to make it 21-7.